One of the more persistent tech unicorns is the rumored Surface Phone, a smartphone built by the Surface team that would run full Windows 10 and utilize many of the same design concepts as the rest of the Surface line. If such a device is on its way, or even something similar, then Microsoft will need to optimize Windows 10 to even more granularly support different form factors. And new evidence suggests this is exactly what Microsoft is doing. 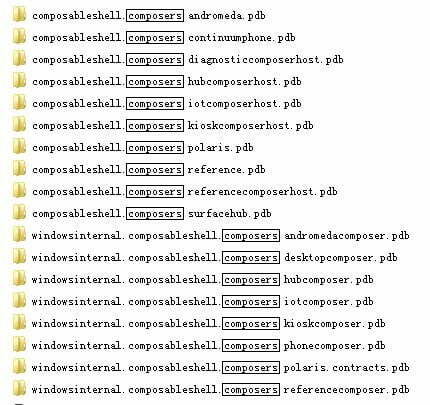 According to reliable leaker WalkingCat on Twitter, code in the latest Windows Insider builds indicates that Microsoft is creating a host of different Windows 10 shells for a variety of different devices. These shells would present an optimized user interface depending on the device, all built on the same Windows 10 OneCore OS kernel. Each would be capable of running the same apps and would offer largely the same feature set, but interface elements would be resized and reformatted to support different screen sizes, input options (such as pens), and other differences between devices. Looking at the list, we see a number of references to different systems, including Internet of Things (IoT), Surface Hub, and both Andromeda and Polaris. Andromedia is suspected to be a potential shell for dual-hinged devices similar to Microsoft’s Courier concept from a few years ago, and Polaris is thought to be a slimmer, lightweight operating system for the thinnest and lightest laptops, 2-in-1s, and tablets. WalkingCat isn’t convinced that Andromeda is a “phone,” however, indicating in another tweet that it’s more likely that it fits a “HingedDualScreenDevice” category. We’ve seen a number of Microsoft patent applications involving such a device, which would be highly mobile, would utilize a special notetaking app, and would be pen-enabled. Check out the following video for Microsoft’s original Courier concept that’s strongly suggested by recent rumors. Clearly, Microsoft has plans to implement a modular version of Windows 10 that can adapt to any form factor. Whether or not a “Surface Phone” ever materializes, it’s increasingly likely that some kind of highly mobile device, possibly with cellular calling capabilities, will arrive as part of the Surface line of hardware. If so, then that will represent another category of devices that Microsoft has created, to go along with the increasingly popular 2-in-1 notebooks.